The Mettler Toledo AL204 Analytical Balance is an ideal choice for every day, easy weighing tasks. This microprocessor-controlled lab scale has a simple to use digital interface and membrane key pad navigation. This analytical balance can weigh in g, kg, mg, ct, lb, oz, ozt, GN, dwt, momme, mesghal, tael, tical, tola, and baht, and can be used for piece counting, percent weighing, dynamic weighing, plus minus weighing, and calculation, as well as one slot for a custom free factor. 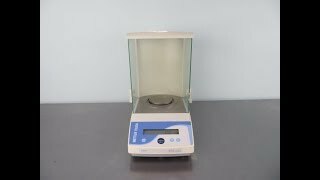 The Mettler Toledo AL204 Analytical Balance has a capacity of 210g, with a readability to the 0.001 decimal, and can be calibrated with external weights. This digital lab scale comes with a three-door glass draft shield, a hook for below weighing, and can be operated with either the AC adapter or 4 AA batteries for portability.